Crowdstaffing is the hiring platform where recruiters earn two ways: filling new jobs with your existing talent pool, and sourcing new candidates for your client’s hard-to-fill roles. It’s a growth engine that massively scales. New clients and jobs are added to the platform every single day, across every location, specialty, and job type. Your candidates rely on you to help them find great roles. Now you can over-deliver with amazing employers and opportunities. Get paid for every successful placement. It's that simple. Post hard-to-fill roles and leverage the crowd to submit candidates to you. GAP, Walmart, SpaceX, Uber. They're your clients once you join. No business development or client contracts needed. Fill as many jobs as you can handle. 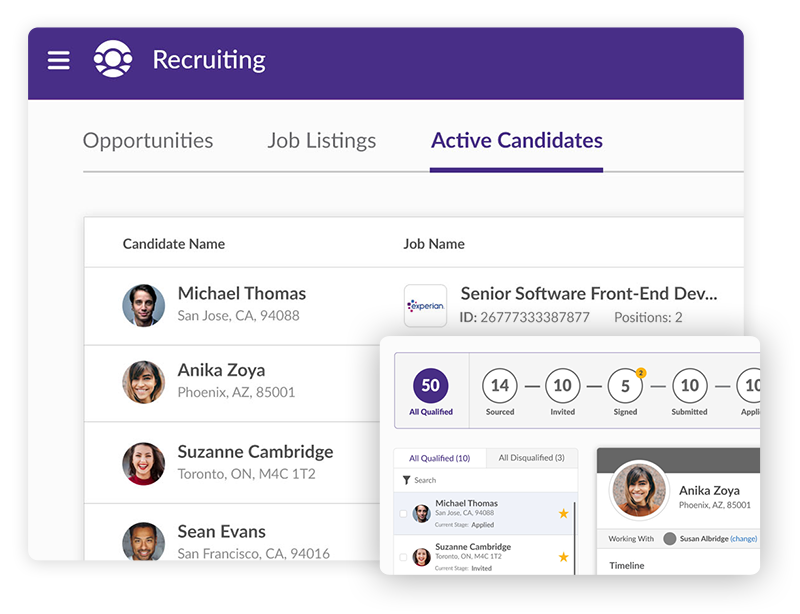 The best of AI to match roles to candidates and recruiters, and easy tools to automate much of the hiring flow. New clients and jobs are added to the marketplace every single day, across every location, specialty, and job type. Post hard-to-fill jobs and let the crowd source talent for you, or search from among hundreds of thousands of candidates already vetted and ready to work. eBay, GAP, Walmart, SpaceX. They're your clients once you join. No business development or client contracts needed. Fill as many jobs as you can handle. We’ll send you the instructions to create an account right away. You’ll also start receiving alerts on roles that match your expertise. Submit your best candidates and receive fast feedback from the client. When the candidate is hired, we can handle onboarding, compliance and payroll. You simply sit back and get paid. How do I join? What are the criteria for suppliers to join? Our application and onboarding process is straightforward and simple. First let us know you are interested by filling out a quick form. We will evaluate it quickly. Once approved you’ll receive instructions to create an account. You'll receive a login with instructions on how to use your dashboard and you can start to review jobs and submit candidates right away. Crowdstaffing recruiters have proven expertise in their domains and geographies. Some are independent, many are teams with established agencies. How are you different from traditional hiring marketplaces? Crowdstaffing was purpose-built for recruiters. Intelligent job distribution automatically searches and delivers jobs that match your domain and geographical expertise. Recruiter team management tools help you collaborate and manage workflow. Talent Advisors vet your submissions and coach you on how to meet individual hiring manager needs. As the employer of record, Crowdstaffing takes responsibility for paying the employees, workers compensation, proper tax withholdings, employee relations, and any necessary insurance requirements. And the easy-to-use interface helps to streamline and manage the talent acquisition and application process from A to Z. Plus you’ll receive direct placement fees even for your contingent placements. Who are your clients? How many new jobs are added each week and where? GAP, Walmart, Philips and Uber are just some of the brand name clients that are on the Crowdstaffing marketplace today. You have full access to all of the roles and opportunity to fill as many as you can handle. No business development, RFP’s or client contracts needed. We handle it all for you. Our sales team is developing new MSP clients and Direct Client engagements on a regular basis, so we are adding new clients and hundreds of jobs every week all across the United States and Canada. And you can fill jobs from where you are today. How quickly will I get feedback from hiring managers? We know that timely feedback is crucial to your success. Crowdstaffing Talent Advisors work directly with hiring managers and candidates to expedite feedback often within a couple of hours while some clients may take 24 to 48 hours. Potential earnings are calculated per requisition and you get to determine which opportunities are right for you. When you fill contingent roles you are paid just like a direct placement at an hourly rate. This means you receive an hourly rate for each hour that your placement works. Whether they are on a 3-month or 3-year assignment, you continue to get paid.